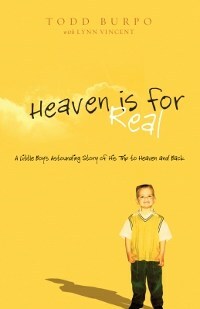 You may wonder how a review of the book Heaven is For Real even fits into the mission and theme of this blog. Liberal professors on a college campus don't usually push any brand of Christianity (they're against all of it), and students generally don't defend a certain brand of Christianity (they're just trying to hold on for dear life and defend the basic elements that define generic Christianity). I would like to suggest a different strategy for those defending Christianity in secular environments, including college campuses. Defend it biblically. What do you mean? I mean defend a brand of it. Defend the biblical brand. Don't defend something that undermines itself. What does this have to do with Heaven is for Real? Here's what it has to do with it. In our postmodern day and age, experience is everything. I mean, we are more prone to leave the defenses of a logical argument in favor of an experiential story (not that experience is always bad) because we think its more convincing and less likely to be questioned. You're intolerant if you question experience aren't you? This is where Todd Burpo's Heaven is for Real fits in. It's a modern apologetic. You mean Heaven is For Real should be put on the same shelf as Evidence that Demands a Verdict and The Case for Christ? Yeah, that's basically what I'm saying. Listen to the title for a minute. This book is trying to authenticate the idea that heaven is not just a fairy tale as your college professor may have you believe. It is a real place. Here's my question though. What's the source of authority? Is it God or a little boy who happened to supposedly have a trip there? If it's man, then we have a problem. The very point of Christianity is to trust God above all---not man. But can't a little boy lead you to trusting God? That's like saying, won't candy lead me to healthy food? I'm not demeaning personal testimonies here. There's a place for them, and the apostles regularly gave their own experiences...but always in subservience to the Word of God. In other words, their testimony was consistent with God's word (Heaven is for Real contradicts it), and they tried to sway their audience by showing that God is the only reasonable truth center there is. It went like this: God is real, therefore my experience is in line with this truth. Not, my experience is line with this truth, therefore, God is real. Others have done a better job cataloging the Scriptural problems with this book. So I'll point you to one of them now (Heaven is for Real Review). My main point however is this: If your foundation is the Word of God, don't use as your authentication something outside the Word, especially something that undermines it. This is not a work of apologetics. It's at best an overconfident work of personal testimony, and at worst a work of fantasy. Not something you want to give your classmates or your professors. I enjoyed this book immensely, highly recommend it and also believe that it will probably cause you to want to see the movie as much as I now do. More than seeing a feature film, however, this book strikes a new excitement and anticipation for heaven and that is always a good thing.